The first known grant of land in East Heddon was from the Bolbec barony of Hugh de Bolbec some time before 1140 when he gave to William de Lisle, 'East Hedwyne'. The next grant was to Bernard Darreyns, whose son Guy held it in 1242, and grandson Roger in 1262. On the division of the Bolbec Barony in 1355, East Heddon passed to the Greystokes and Robert of Harle and his heirs. 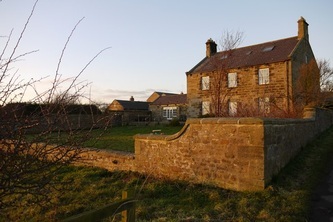 1438 saw the estate in the hands of Robert Elrington whose family held it up to 1511 when it passed into the hands of the Fenwicks of Brinkburn and Burradon. "I saw come marching owre the knows, Fyve hundred Fenwicks in a flock". A prominent feature is the ancient tumulus known as Heddon Law (or Laws). It was here that David Bruce encamped on 'Hydwynlaws' in 1341 during a raid into England. A beacon was maintained on this hill in 1549 and when the Scots invaded England in 1640 and 1643-4,they again camped on Heddon Law. 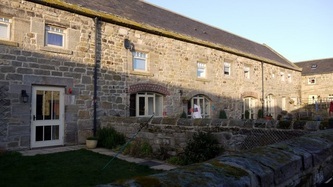 Heddon Law.Photo by A.Curtis (2009). 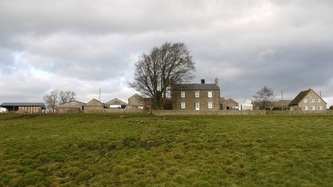 The estate originally comprised three farms,the Birks, Breckney Hill and East Heddon. 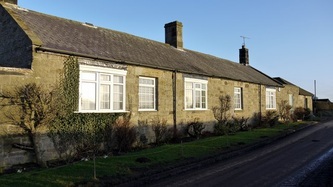 It was to the Birks that the ancestors of the Gibson family went in 1873, farming there 37 years before moving to East Heddon in 1910 where they still farm. 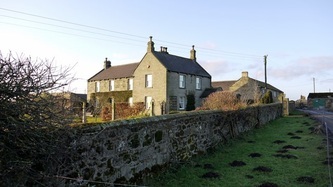 Opposite the East Heddon farmhouse are the remains of the ancient residence of the Fenwicks, used for a time as outhouses, the walls of which are of great thickness. They were recently restored as dwelling houses.